Car ads used to include shorthand like 2D, AWD, and AC. Today’s car buyer is just as likely to ask about USB, GPS, and wifi. 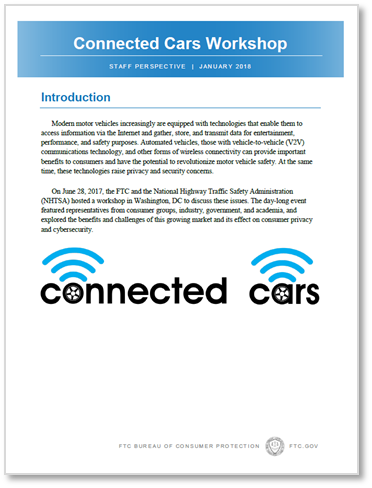 Last June, the FTC and the National Highway Traffic Safety Administration (NHTSA) hosted a workshop in Washington to discuss the types of information that connected and autonomous cars collect and the ways the data can be used. FTC staff just issued a Staff Perspective that outlines key takeaways from the workshop. First, lots of different entities throughout the connected car ecosystem will collect data from vehicles. The technology could deliver many beneficial innovations – faster emergency response, shorter commutes, more tailored entertainment choices, etc. Second, the types of data collected will range across the spectrum from aggregate statistics to non-sensitive data about a particular car or driver to sensitive personal information. Third, given the breadth of information, consumers may be concerned about unexpected secondary uses of that data. Fourth, connected and autonomous cars will have cybersecurity risks that could potentially be exploited by hackers looking to extort money or even do physical harm. To address those concerns, panelists talked about best practices, including information sharing, network design, risk assessment and mitigation, and standard setting. In addition, the Staff Perspective cites some recent post-workshop developments, including the House of Representatives’ unanimous passage of H.B. 3388, the SELF DRIVE Act, and the U.S. Department of Transportation and NHTSA’s new guidance, Automated Driving Systems 2.0: A Vision for Safety, which discusses in accompanying notes the FTC’s role in protecting consumer privacy. I took the fuses out my car. I have no radio. My Concern is the Broad Ban. I discontinued my internet. i was afraid of tgem getting inti My Mac but I guess they have access to everything. The Broad band is only a a ticket to steal. They have stolen ENOUGH! Please Helpe!